Set standard Campaigns to play during out of work hours or maintenance with Fallback Campaigns. This publishing filter sets Campaigns to play only when other Campaigns are not scheduled to play. Tip: Use this filter for Campaigns that are not directed at a specific public and don’t depend on time nor dates. Examples are institutional information, soothing images, jokes, inspirational quotes, etc. On the Content page of your OnSign TV account, click “Publish” under the target Campaign. Select on which Players you want the Campaign to be played back. Underneath the “Play It On Loop” box, select “Play on Fallback Loop”. 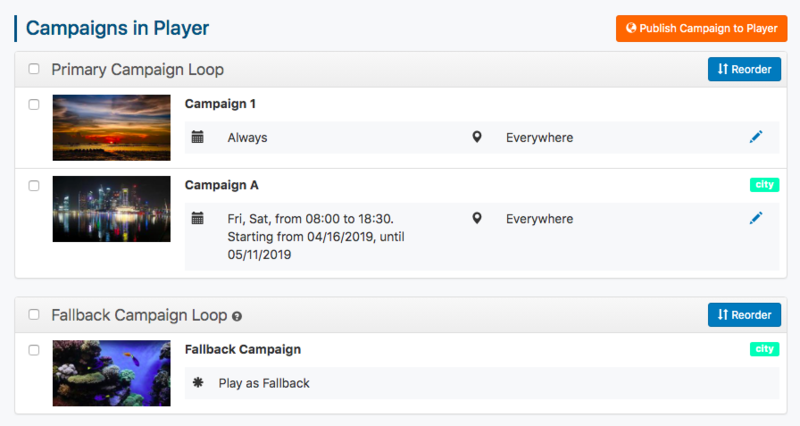 Within Fallback Loop, you can also set the Campaigns to play during a period of time or within specific regions like you would with any other campaign. When done, click on “Publish”. 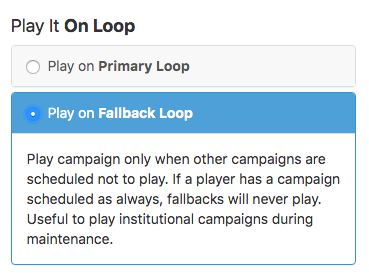 To see your Fallback Campaign Loop, click on the Players tab. Select the Player to which you have published the campaign, then select “Campaigns in Players” from the sidebar menu. The "Fallback Campaigns Loop" list is right under the list of “Primary Campaign Loop”.